Just a few pics of us...Just in case anyone forgot what we looked like. Since it's been months since we've seen any of the Flores family!! We've been so busy the last few months, it seems like so much has happened. Deputy G w/ Lil' G on the Tea Cups in Disneyland. 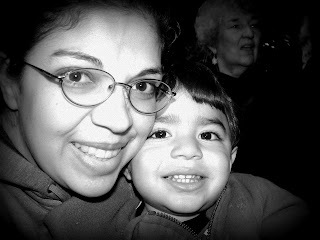 Mama and Aaron on the Jungle Cruise in Disneyland. Aaron has been having some trouble swallowing and has been choking at night so we have been in and out of doctors appointments regarding this problem. The latest is that we have to spend a couple of days in San Jose so he can have a "sleep study" done, that will determine exactly what the problem is and then we will finally know how it will be treated. We are hoping that he doesn't need surgery, but if he does, at least the problem will be corrected. But we have been told that surgery on such a young child has many, many risks. So we have been pretty stressed out about this. 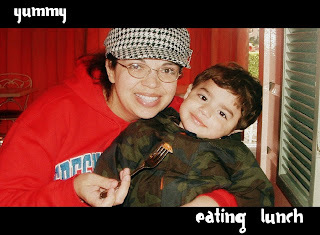 Mommy and Aaron eating lunch at our 'beloved' Plaza Restaurant in Disneyland. We ate almost EVERY meal at this restaurant, Gerardo wouldn't eat anywhere else, it was expensive but sooooo worth every penny..it was totally yummy!! My princess with Princess Snow White. She was so happy to meet the princesses. She's so funny and precious. She talks so much now and has all her own ideas and though processes. It's so fun to hold a whole conversation with her, she's very smart. One little story about Lilly: When we were at Disneyland, we were in the hotel room one night. The kids were running around wild and Aaron pushed a button on the clock radio that was sitting on the nightstand. Music started to play, SUPER loud, Spanish music. Before I could get there to turn it off, Lilly and Aaron stood in front of the radio dancing, and Lilly looked up and told Gerardo and I "Oh, this is Grandma Chayo's favorite song"...it was so sweet, I guess she just associated the Spanish song with her Grandma Chayo, I don't know, I don't really have an answer. But it did put a little tear in her daddy's eyes! !